The miners were trapped on December 13 when water from Lytein river flooded a rat-hole mine in East Jaintia Hills district. 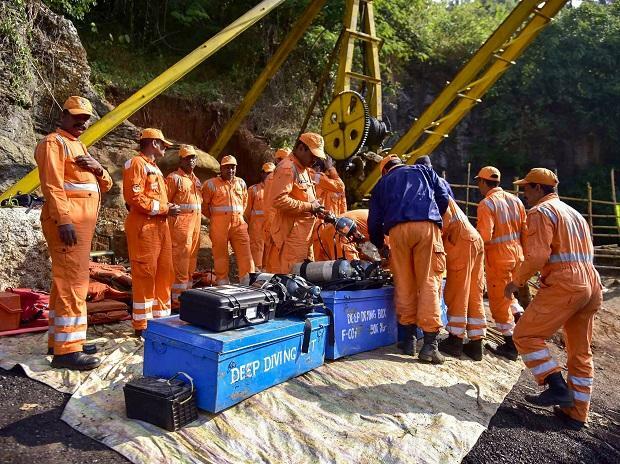 The Supreme Court said on Thursday it was dissatisfied with government efforts to rescue 15 workers trapped in an illegal coal mine in Meghalaya, asking why the Army’s help isn't being asked to help. "For people who are trapped there, every minute counts. Immediate steps are needed said," said the court as it asked the Centre to apprise it by Friday the steps which the government intends to take in the matter. "As the Union, you should do something now. Either you take the help of Army, which has not been done yet. They (Army) are ready and they have volunteered also," a bench comprising Justices A K Sikri and S Abdul Nazeer told Solicitor General Tushar Mehta. "We are not satisfied (with steps taken for rescue). It is a question of life and death. What has happened in the last so many days we do not know. No matter whether they (trapped persons) are all dead, some alive, few dead or all alive, they should have been taken out by now. We pray to God that they all are alive," the court observed. Mehta told the court the National Disaster Response Force (NDRF) was working at the mine and the government has sent Navy personnel. "72 members of NDRF are already there but still no result," the bench observed, adding, "Why cannot you take help of the Army? He (petitioner) says that water pumps were sent to Thailand. Why cannot it (pumps) be used here also?". The petitioner has said in his plea that Kirloskar Brothers Ltd (KBL) had offered high-powered water pumps and given technical support to the Royal Thai government in June-July 2018 for the operation to rescue a football team trapped inside a cave system in Thailand. Mehta, while maintaining that the petition seeking urgent steps for rescue of these 15 persons was not adversarial, said he would take instructions in the matter. He said that the Union coal minister had held a meeting, which was attended by the chief minister of Meghalaya, and a nodal officer has been appointed. The bench, while issuing a notice to the Centre on the petition, said, "We have requested solicitor general Tushar Mehta to look into it with regard to the urgency involved as it is a question of life and death." The counsel appearing for the state said adequate steps have been taken and besides 72 NDRF personnel, members of state disaster response force, the Navy, fire department and Coal India Ltd were also involved in the rescue operations. The bench noted in its order that the court was of the view that "prompt, immediate and effective operation is required for rescue of these miners". At the outset, the counsel appearing for Meghalaya said they have already taken steps for rescue of these persons. "What steps have you taken? These miners are trapped there for long time. You may have taken steps but they are still trapped. You need some support from the Central government," the bench said. To this, the state's counsel said the Centre was also lending support to them in the rescue operation. "Then why you are not successful yet? Is it because of the water?" the bench asked.